Phoenix voters on Tuesday joined a chorus of cities across the nation by passing reforms aimed at controlling surging employee-pension costs that are chipping away at budgets for local services. Early returns from a special election suggested residents overwhelmingly approved Proposition 201 and Proposition 202. The measures will overhaul the retirement system for thousands of new city workers, potentially saving taxpayers nearly $600 million over 25 years. Supporters said the victory means millions of dollars that might have gone toward pension costs can be spent on everyday services that affect residents, such as public safety, libraries and parks. The City Council has enacted a food tax and cut services in recent years while pension costs soared. But critics have said Phoenix’s plan either goes too far or doesn’t go far enough. A few council members unsuccessfully pushed to further limit the city’s costs while employee union leaders said the changes will hurt working families. Despite some criticism of the propositions, there was no organized opposition, and “Yes on 201” signs dominated many Phoenix street corners. Tuesday’s unofficial results indicate both proposals were approved by a comfortable majority of voters. A final tally including provisional ballots and some early ballots was not expected until later in the week, but the vast majority of Phoenix voters typically cast mail-in ballots well before an election. Under the reforms, the biggest source of savings is a requirement that new workers split pension contributions 50/50 with the city. Currently, Phoenix contributes roughly four times more than employees to keep the ailing system afloat. Today, an employee’s contribution is capped at 5 percent of their paychecks while the city’s portion is roughly 20.1 percent of each employee’s pay this fiscal year. Both sides are estimated to pay 12 to 14 percent starting with the next fiscal year in July. Taxpayers’ tab to fund the ailing Phoenix Employees’ Retirement System has ballooned, from $28 million in 2000 to $110 million this fiscal year. The city must pay annual pension costs not covered by employee contributions or the system’s investments. “Phoenix can’t compete for jobs, technology and innovation firms, and intellectual capital if handcuffed by a pension (system) that forces cuts to other programs,” said resident Jason Zaler, 27, who voted for the reforms. Proposition 201 also raises the minimum retirement age for employees by about 3.5 years, on average. Union leaders have been particularly concerned about this aspect of the proposition. The change would not allow a new employee to retire until the combination of that person’s age and years of service equals 87. Workers currently can retire when their age and years of service total 80. Employees who don’t meet the “Rule of 87” could still retire at age 60 with 10 or more years of service and 62 with five or more years. The size of the retirement package is affected by how long a person has worked. However, the impact of the reforms will be gradual because the changes would not affect many city employees. Reforms would apply only to employees hired after July 1. The change would not affect police officers, firefighters and elected officials because they are under state-run pension systems. Changing the formula used to calculate pensions so employees have an incentive to work longer. With the current system, the multiplier used to calculate a retiree’s pension becomes less favorable on time worked beyond 32.5 years. Giving the city more flexibility in how it can invest the plan. Currently, the city cannot use certain types of investments that officials say could increase its yield, such as private-equity accounts or high-yield bonds. Allowing the city to put more money into the retirement system than required to meet its obligation for a single year. This would allow the city to pay down its unfunded liability in strong economic times. Under the current rules, it cannot contribute more. Like many U.S. cities, Phoenix’s pension costs have surged in recent years as the recession choked its rate of return on investments. The financial hit has stoked criticism of government-worker benefits and comparisons to the private sector, which began eliminating pensions decades ago. The list of major cities to seek reforms in the face of such rising costs is growing: Chicago, San Francisco, Cincinnati, San Jose and San Diego, to name a handful of recent cases. Other Arizona cities don’t have quite the same problem because, excluding Tucson, they all participate in the state-run retirement system for general employees in addition to the systems for public-safety workers and elected officials. 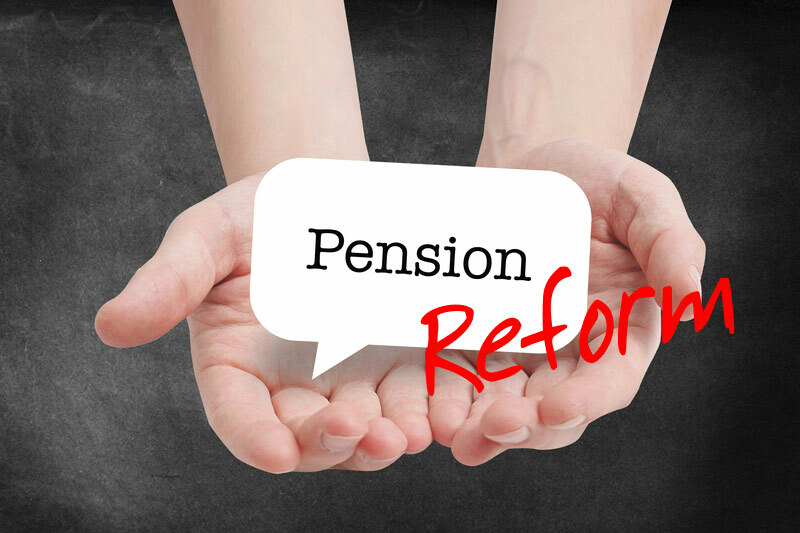 Last week, a report released by the Pew Charitable Trusts, a non-partisan think tank, raised concerns about the unfunded liabilities of pension systems in 15 of 30 large cities across the nation, including Phoenix. To be considered fiscally healthy, experts said cities should have assets to cover at least 80 percent of what they owe in benefits. Phoenix has assets to cover about 62 percent of what its owes in benefits, down from 73 percent in 2009. That’s a unfunded liability of about $1.1 billion. Kil Huh, who leads Pew’s local fiscal health research team, said the reforms before Phoenix voters are similar to those proposed by many other cities, with exceptions like San Diego, which moved to a 401 (k)-type plan where the city contributes to a retirement account but does not guarantee a specific benefit amount to new employees. DiCiccio and other conservative leaders have said the reform package doesn’t go far enough to limit the unfunded liability to taxpayers. But city officials said DiCiccio’s proposal to move to a 401(k)-system would have cost taxpayers far more upfront. An effort to cap the city’s contribution also failed. Meanwhile, Stanton and other supporters said the changes strike the right balance between saving taxpayers money and ensuring that Phoenix offers quality benefits needed to attract top employees. Reprinted from The Republic. Article by Dustin Gardiner, The Republic | azcentral.com. Republic reporter Eugene Scott contributed to this article. Read the original story here.